Sometimes, nature is just so spectacular that all you can do is stand in awe of it. Nowhere is this more true than in the Republic of the Congo, where Mother Nature’s breathtaking might is on full display in the form of a chimpanzee driving a Volvo that has been continually running over scientific researchers in the rainforest for the past seven decades. 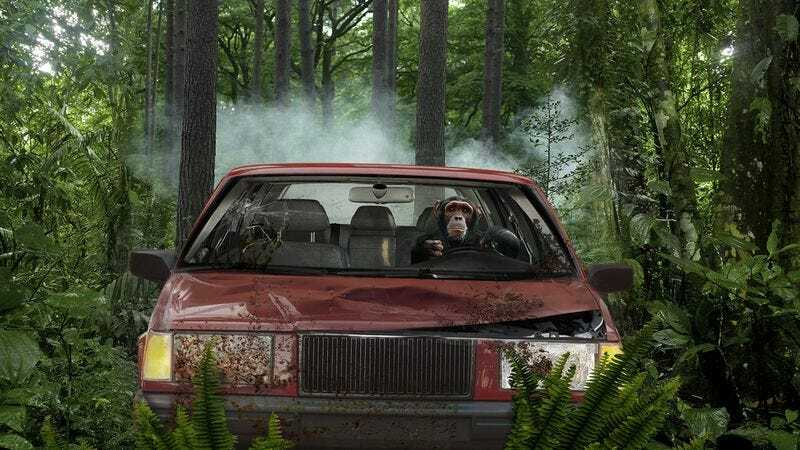 Its engine echoing hauntingly around the jungle for minutes before it’s visible, the chimp in a Volvo is a stunning testament to the majesty of our natural environment. Despite the danger it poses, hundreds of scientists from around the world still flock to see this natural wonder each year. Wow. Day after day, the Volvo rolls madly through the jungle, its chassis shuddering in symphony with each scientist who falls beneath its tires as the chimp drives on, propelled by a force that seems to emanate from the planet itself. Amazing. It’s a humbling image, and it’s just another reminder of nature’s astonishing power and beauty.